I had originally intended to post something about the month of January. That idea seemed lame to me when this piece by the late Hannah Wilke caught my eye (especially after I found out the backstory) and made my internal art history wheels turn. 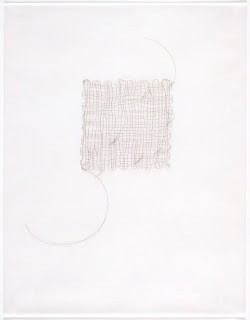 I’m always vaguely uncomfortable (read “involuntary gag reflex”) with art works that feature human hair. Heck, I don’t even like walking in hair clippings on the salon floor when I go for a trim. But, I can surely assert that human (and animal, of course) hair has been an artist’s medium since forever. It was not until the 1900s, however, with the Dada and Surrealist movements, that human hair became featured subject matter in art works. I’d like to explore other ways that human hair has played a major role in works of art, often in powerful ways. In her life and work, Hannah Wilke was a pioneer in the Feminist Art Movement. Born in New York, she majored in both art and education, receiving both BA and BS from Tyler School in Philadelphia in 1961. She went on to teach sculpture and ceramics at School of the Visual Arts in New York from 1972 to 1991. Her earliest work concentrated on sculpture and ceramics. In the late 1950s, she instituted a series of works inspired by female anatomy called “female iconography,” thereby becoming one of the first artists to explore feminist imagery. She participated in groundbreaking feminist publications “Anonymous Was a Woman” (1974) and “Art: A Woman’s Sensibility” (1974) from the Feminist Art Program, Cal Arts, Valencia. In the late 1970s, her focus switched to photography, installation, and performance. After her mother was diagnosed with breast cancer, she began to document her mother’s condition, and herself. One collaborator in her early self-portraits was Claes Oldenburg (born 1929). 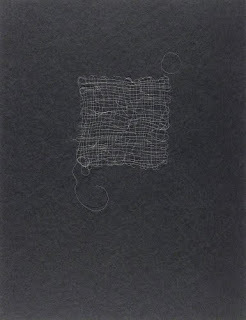 In the 1980s she continued to explore a variety of self-exploration, both in photographs and sculptures/installations. These works explored the idea of woman’s control of her body, objectification by men, and body image. Body image became particularly key to her work after she was diagnosed with breast cancer in 1987. Brushstrokes is part of the documentation of her travails with chemotherapy. At first glance the hair on paper could seem to represent the swipes of a paint brush. But it is the hair brush that created these forms when Wilke brushed her hair after chemo. I think it is still a cultural custom to save locks of hair, either from babies or from precious relatives. I’m not at all sure when it became a custom, but I guess one could look at it as if preserving something living from the past. I don’t know, I still find it sort of creepy. Even though I sometimes wish I could have lived during the times when President Washington was around, I’m not sure about the lock of hair. Here we have a lock of his hair that is not only part of the medium, but actually the subject! I wouldn’t be surprised if Washington wore wigs all the time. The poor guy had his hair snipped at every momentous occasion during the Revolution. In the early United States, locks of Washington’s hair were coveted by all of the new states. I can’t find any mention of where this lock originated (other than on the future president’s head), but since the LCP dates it to 1781, I’m going to venture a guess that it came from the momentous victory at Yorktown, Virginia, that ended the Revolutionary battles on colonial land. The Sioux nation was originally made up of seven bands, or “council fires”: four Dakota, two Nakota, and one Lakota. This group of council fires was called the Oceti Sakowin. The nearby Chippewa called it the Nadow-is-iw, which the French corrupted into the term Nadowessioux. That in turn was shortened to Sioux. The Dakota Sioux had their first contact with whites (French trappers) near Green Bay, Wisconsin in 1640 and 1658. The original social organization of the Sioux bands did not have a chief to oversee all of them. Instead, each band had prominent warriors who were “shirt wearers.” When the bands would gather together, four of the shirt wearers would be camp leaders. The scalp shirt was what distinguished a shirt wearer from other members of the band. The scalps attached to the shirt were not mere decoration, but a tally of the man’s war count (or coup in French). Counting coup was a system of grading war honors, special acts of bravery, and war aggressiveness. A warrior received a coup when he struck the enemy with a hand weapon or killed the enemy in battle. Often the coup was represented by the enemy’s scalp, which was removed from the back of the head where hair grows the longest. The warriors believed a man’s hair represented his soul. However, only Natives’ scalps were valuable when accumulating coup. While the scalps adorning a shirt supported the owner’s claim to war count, there were also other objects that marked coup. These included eagle feathers, painted buffalo hides, and the coup flag, a staff adorned with multiple eagle feathers. 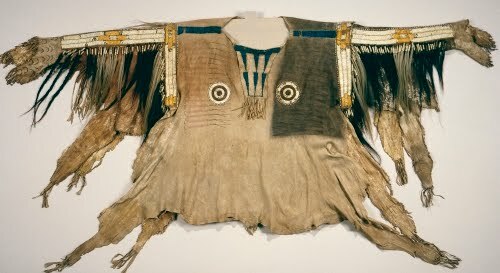 This shirt was made before the reservation era. The scalps are augmented horse hair. During the reservation era, hair was clipped from family members or horses. The shirts were decorated with locks of hair from friends and loved ones as a way of honoring a brave warrior. The veneration of prominent ancestors by augmenting their skulls with clay and decoration has been a human practice since the late Neolithic Age in the Middle East, ca. 5000–4000 BCE. Such decorated skulls were found in ancient Jericho, the oldest known city on Earth. If they attached a lustrous crown of hair on those skulls, I’ve never seen it. New Guinea is divided between Irin New Guinea (part of Indonesia) and Papua New Guinea. It is the location of the largest number of dissimilar cultures in Melanesia. It is also the island of the most diverse and prolific artistic production of Oceanic art. 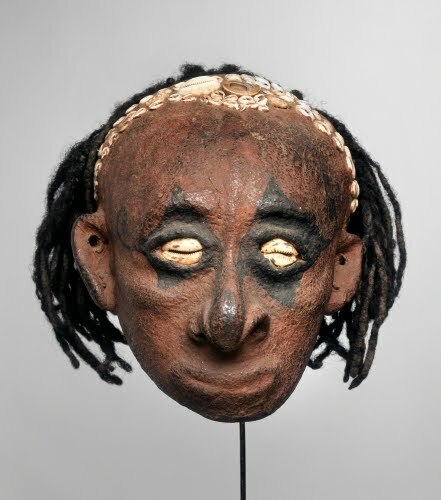 Artistic production along the Sepik River, located in the northeast of the Asmat region, is particularly rich. Sculpture, painting, or carving adorns almost every object of secular and ritual life. By embellishing objects used in everyday life with art, it has been traditionally believed to bring the world of the spirits into active participation with the world of the living. 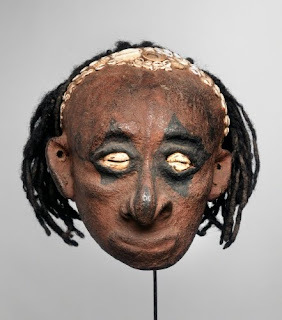 The Iatmul People are located on the Middle Sepik River. They are closely related to the nearby Sawos and have traditionally controlled fishing. They inhabit about twelve communities in the region. One of the more noteworthy art forms of the Iatmul are the decoration of ancestral skulls. The skull of a prominent or respected deceased person is covered with clay and painted; cowrie shells are added as eyes and decoration. The skull is then exhibited with either a carved wooden or basketry "body" in a communal spirit house immediately following death. They are then stored away and brought out as venerable ancestor representatives during ceremonial occasions. What better way to connect human hair as part of an art work than in one that was created in the years after the first Earth Day (22 April, 1970)? Kudo Tetsumi is a fascinating artist who was a progressive modernist voice in Japanese art within the first ten years after the end of World War II (1939–1945). His art consists of sculpture, performance, installation, and performative painting. The overlying theme in most of his work is a critique of contemporary culture’s worship of technology, consumerism, and exploitation, particularly of the environment. 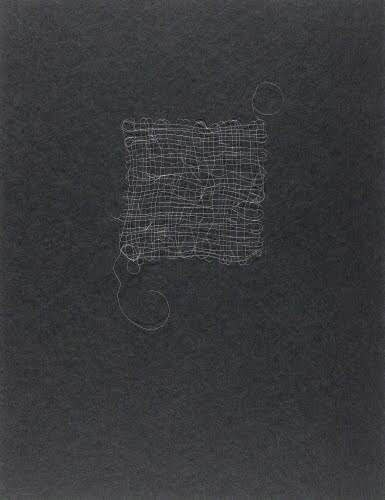 Kudo was a strident voice in the anti-art Fluxus Tokyo group in Japan as early as 1957. Experimental artist groups had begun appearing in Tokyo as early as 1952, the first year after the Allied occupation had ended. Like the Fluxus group in Europe that developed at the same time, Kudo’s colleagues ridiculed traditional art practices, rejected traditional exhibiting spaces, and were inspired by international contemporary movements. 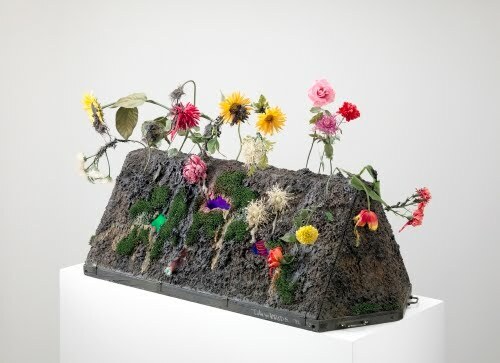 Ironically it was that Western modernity, so heavily influenced by Western technology, that Kudo came to despise, expressing that sentiment in works using environmental themes. Kudo was not only upset by the denigration of the natural world, but also the constant threat of destruction in the post-Hiroshima world. This work is not an optimistic vision of a Utopian future of humans in harmony with nature. His idea that humanity as well as nature were metamorphosing in the polluted environment foresees a new, not necessarily pleasant, ecology emerging. 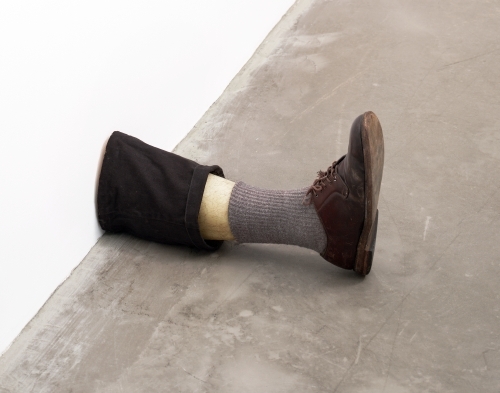 I’m not aware of whether or not Duane Hanson (1925–1996) ever used human hair in his stunningly life-like sculptures, but that’s what Gober’s leg series puts me in mind of. Is it Pop because of its use of banal everyday clothes? Is it New Realism because of the detail? Or is it Neo-Expressionism because of the disturbingly cut-off limbs? You decide that. Gober was born in Wallingford, CT, and studied art and literature at Middlebury College in Vermont. Although his earliest exhibited works (1984) were paintings, he ultimately concentrated on sculpture. Starting in the late 1980s, Gober began to produce reproductions of everyday household objects in non-everyday materials, such as kitchen sinks either in odd juxtapositions with other objects or in fantastic scale. Taken out of their regular context, such objects take on an odd, almost sinister aspect. Later, Gober produced many versions of a man’s leg. Just as is true with the sink sculptures, the leg sculptures do not share the interest in modern mass media or crass consumer culture, as is seen in his contemporary Jeff Koons (born 1955). The subject of a more-or-less disembodied male leg strips it of any power it might have had and dispels long-held beliefs about fine art. What is clear is Gober’s insistence on the integrity of the medium, replete with human hair. 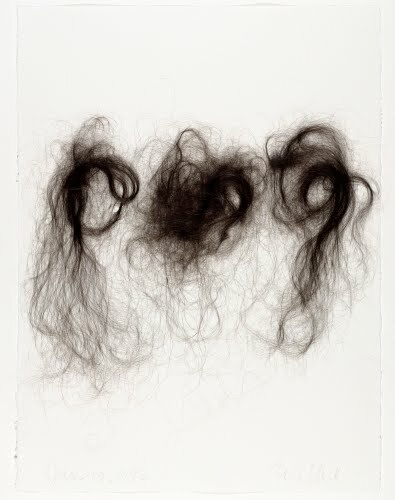 If any work involving human hair doesn’t activate my discomfort index, it would be the hair pieces like these by Mona Hatoum. I’m not sure about her keffieh woven from her own hair, or the hair necklace: those are a little yuck. But this piece is so delicately made and beautiful. It reminds me of the delicacy of a spider web. Conceptual and Feminist artists pioneered the use of their own bodies to explore psychological and physiological identity. Hatoum uses her own hair to explore issues beyond self, issues of power, fragility, conflict and peace. 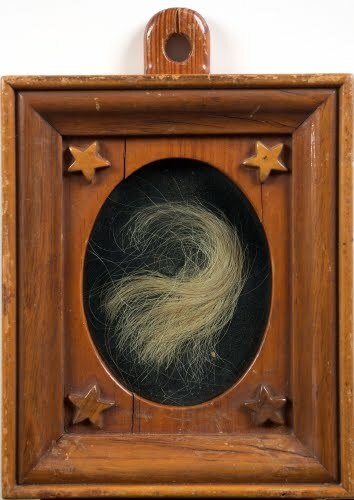 This investigation through the most personal of domestic items—excised hair—is magnified in works that she has created at the same time in everyday household objects made terrifying by manipulation or addition of menacing components, such as colanders ornamented with steel spikes. Hatoum is Palestinian, born in Beirut. Although she wanted to be an artist, her father persuaded her to study graphic design, a more promising career in Lebanon at the time. While studying graphic design in London in 1975, the eruption of the violent civil war in Lebanon forced her to stay there. She took the opportunity to then study fine art at the Byam Shaw School of Art (1975–1979) and the Slade School of Art (1979–1981). While studying at these schools, she realized the power of incorporating feminist and political issues in her art. From even her student years, her art was highly personal, mostly performance. She gradually moved into photography, video, installation, and sculpture to reflect such ideas as isolation in exile, disenfranchisement, war and its desolation, and, by association, the similarities in the situations of women. She began her hair pieces in the 1990s. These visually solid-seeming grids—almost like wire-mesh screens—belie the true delicacy of hair, reflecting on the fragility of humanity in a discordant world.